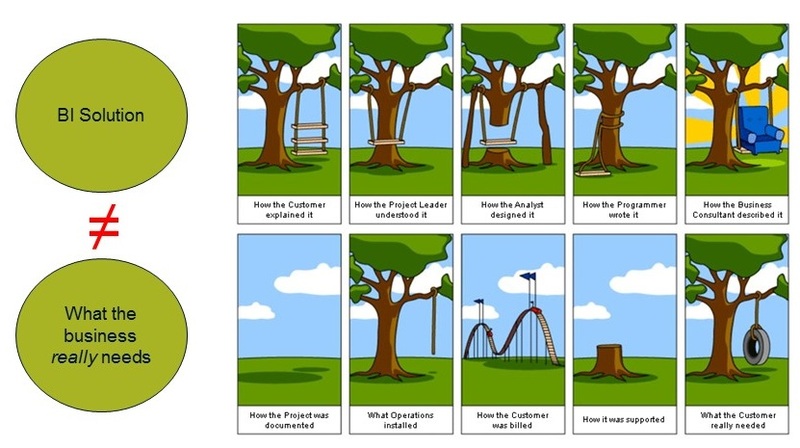 Practically every BI project is about requirements, because requirements communicate “what the client wants”. There are essentially two problems with this communication: the first is that clients often do not end up with what they really need. This is illustrated in the famous drawing in Figure 1: What the customer really needs. The second problem is that requirements can change over time. Thus, it can be that, especially in the case of long implementation cycles, the client and the contractor share a close consensus about what is wanted at the time of the requirement analysis. By the time the solution goes into operation, however, essential requirements may have changed. 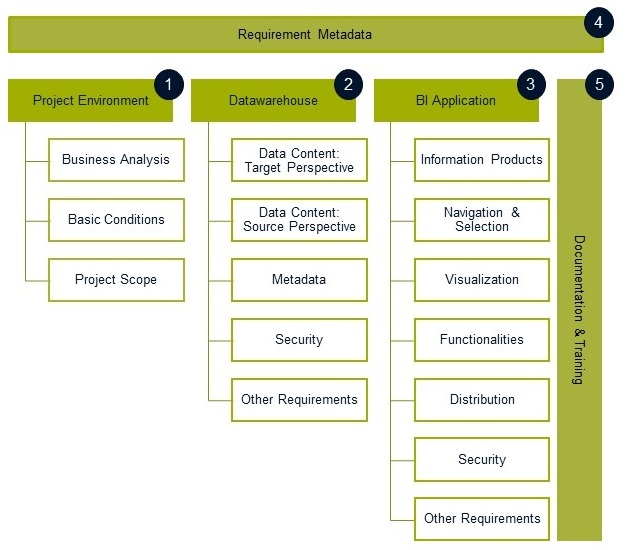 The area of requirement topics addresses the question of what subjects should be considered at all as requirements in a BI project. I’ll go into a little more detail about this later in this article. 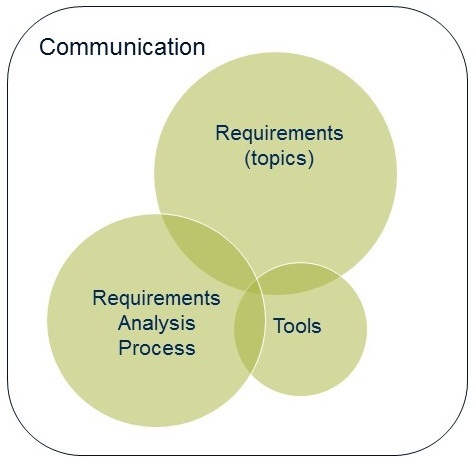 In the requirements analysis process, the framework defines possible procedures for collecting requirements. Our preferred form is an iterative-incremental (i.e. agile) process; I have dealt here with the subject of an agile development process through some user stories. It is, of course, equally possible to raise the requirements upfront in a classic waterfall process. We have also created a range of tools to simplify and speed up the requirement collection process, depending on the process variant. This includes various checklists, forms and slides. Now I would like to take a first look at the structuring of possible requirement topics. The broad requirements that arise from the project environment need to be considered to integrate a BI project properly. 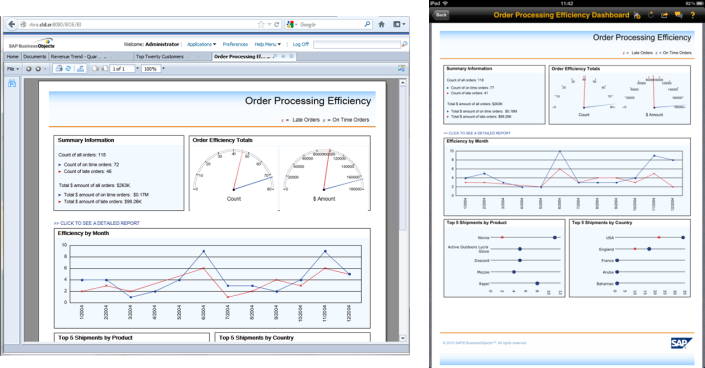 Which business processes should be supported by the BI solution to be developed? What are the basic professional, organizational or technical conditions? What are the project aims and the project scope? If the BI solution to be created includes a data warehouse (DWH), the requirements for this system component must be collected. We split the data requirements into two groups: The target perspective provides information about the key figures, dimensions and related requirements, such as historiography or the need for hierarchies. This is all well and good, but the source perspective should not be forgotten either. Many requirements for the DWH arise from the nature of the source data. In addition, requirements for metadata and security in the DWH have to be clarified. The BI application area includes all front-end requirements. This starts with the definition of the information products required (reports, dashboards, etc. ), their target publication, purpose and data contents. One can then consider how the users navigate to and within the information products and what logic the selection options follow. 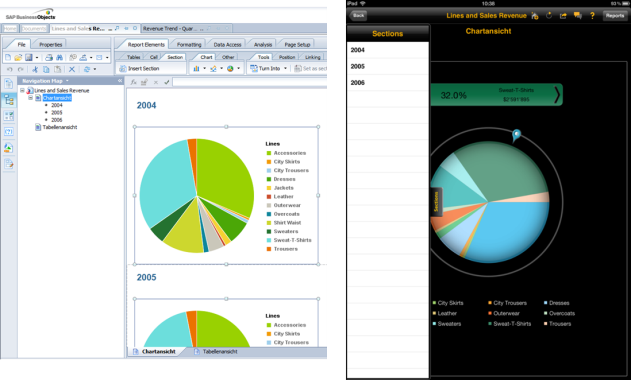 One central consideration is the visualization of the data, whether in the form of tables or of diagrams. In this area, advanced standards such as the IBCS provide substantial support for the requirement analysis process (read an overview of my blog contributions to IBCS and Information Design here). The functionalities sub-item concerns requirements such as exporting and commenting. When it comes to distribution, it is interesting to know the channels through which the information products are made available to the users. And it is important to ask what security is required in the area of BI application too. The issue of requirement metadata is often neglected; however, it is useful to clarify this as early as possible in the project. This concerns the type of additional information to be collected about a requirement: Does one know who is responsible for a requirement? When was it raised, and when was it changed again? Are acceptance criteria also being collected as part of the requirement analysis? Lastly, requirements need to be collected for the documentation and training required for the use and administration of the BI system. In this article, I have indicated that requirement analysis presents a challenge, both in general and especially in BI projects. Our IBIREF framework enables us to apply a standardized approach with the help of BI-specific tools. This allows both our customers and us to capture requirements more precisely, more completely and more quickly, thus enhancing the quality of the BI solution to be created. Upcoming event: Please visit my team and me at our workshop at the TDWI Europe Conference in Munich in late June 2017. 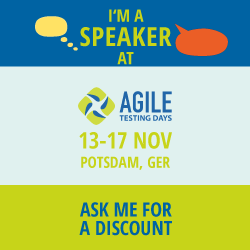 The theme is “Practice Makes Perfect: Practical Analysis of Requirements for a Dashboard” (though the workshop will be held in German). We will use the IBIREF framework, focusing on the BI application part, in roleplays and learn how to apply them. Register now—the number of seats for this workshop is limited! Part 1 of this article you’ll find here. A BI Picture Book is a structured collection of “pictures” aka screenshots of features illustrating one or multiple products. It describes and illustrates the available options in a compact and easy to handle manual. 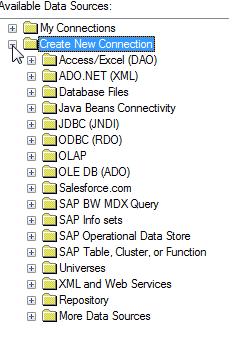 It should help the user to identify what options they have in a given BI front end application. Referring to scenario A and B above, in an ideal world one would create a BI Picture Book during the initial tool selection process (scenario B). In this context, the BI Picture Book helps to illustrate the available features of the different tools under consideration. Some (or all) of these tools will become “strategic” and therefore the preferred tools to be used during subsequent BI projects. In the same way, the corresponding parts of the original BI Picture Book will also be included in the “daily business” BI Picture Book, which only contains the available options regarding the strategic tool set. One main characteristic of a BI Picture Book is that we compare feature (or requirement) categories one after another and not a tool (with all its different features) after another tool. 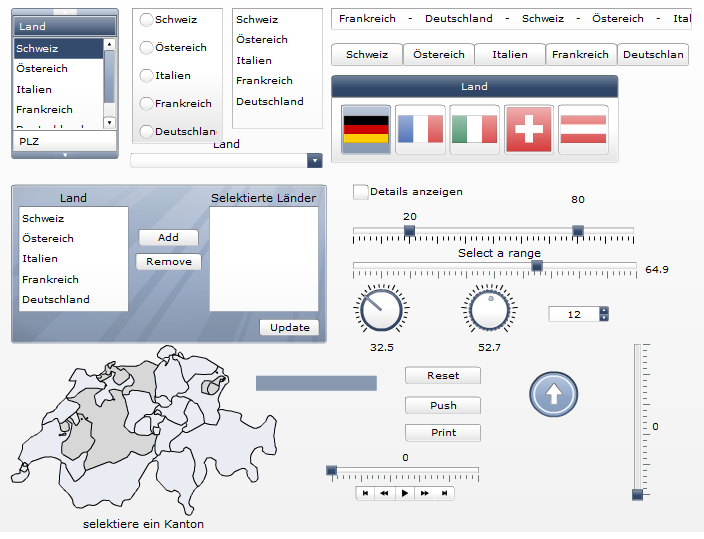 This helps to clarify specific differences between the tools for each category. Based on the previously described structure, the BI Picture Book should contain notes which highlight unique features of one tool compared to the rest of available (or evaluated) tools, e.g. 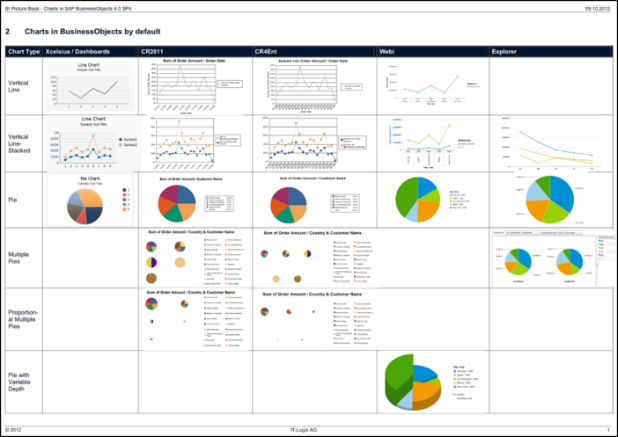 a specific chart type which is only available in one tool. On the other hand, one should highlight limitations regarding specific features that are initially “not obvious”, e.g. in cases where the color palette of charts cannot be customized. Another example is to specifically highlight a tool which does not contain an Excel export (because end users might assume that there is an Excel export for every imaginable BI tool, so that they think they do not have to specify this). What is the primary purpose of the BI Picture Book? 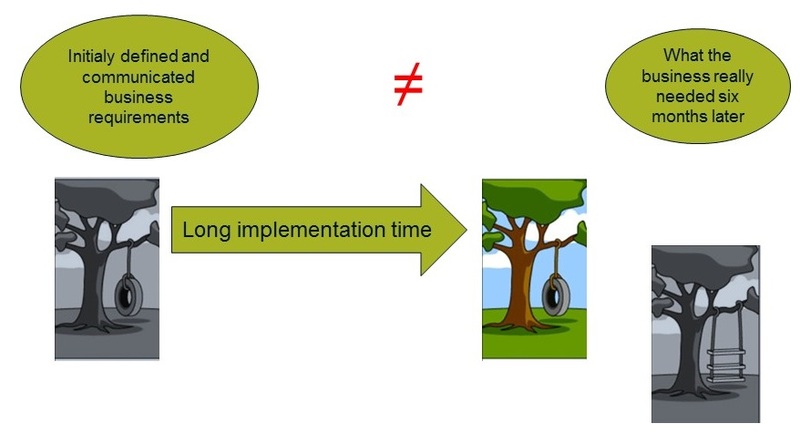 This refers to either scenario A) requirements engineering or scenario B), creating a front end tool strategy. Which BI tool vendors are to be taken into consideration? Which concrete tools of these vendors are to be integrated into the BI Picture Book? 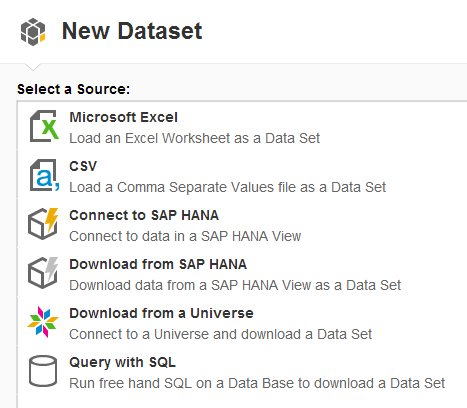 For scenario A) this is defined by the available strategically defined BI toolset. For scenario B) it depends on the procedure for evaluating and selecting tools for your front end tool strategy. Once you know which tools you want to take screenshots of you need to define which software version to use. Depending on the release cycle of the BI vendor, the software version can make quite a difference regarding available features. Therefore a BI Picture Book is mostly specific to a certain version. For cars, there are tuning shops which provide extra features not offered by the car manufacturer. Similarly, in the BI world, there are many add-on providers who extend the available features of BI products. If such add-ons are already in place, it is important to include their features in the BI Picture Book. Nevertheless, one shouldn’t forget to label features from add-on products specifically as they might be charged additionally. Do not show options which are not applicable in practice, e.g. 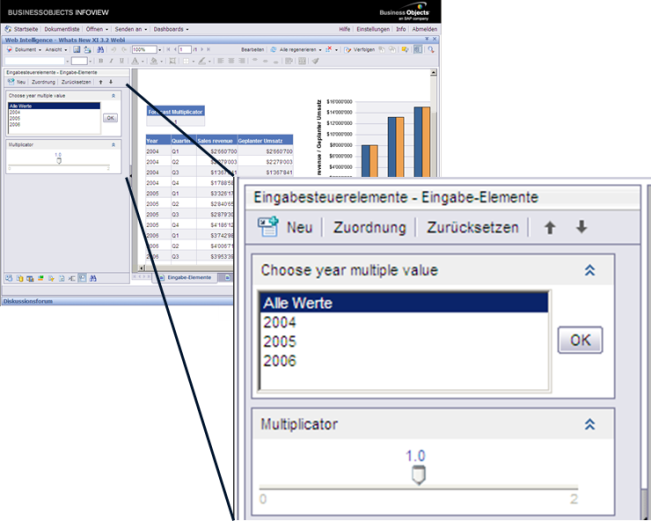 system wide customizations on a multi-tenant BI platform. An example is customizing the look and feel of the BI portal by modifying the portal’s CSS style sheet. Although, in theory, this option might exist, depending on your organizational and technical setup, to changing the style sheet might not be allowed because many other stakeholders would be affected. After having answered these questions, you can start: Take whatever screen capture program you like and start taking the screenshots. Use either a tool like Microsoft Powerpoint or Word to collect and layout the screenshot in a meaningful way. Keep an eye on the point that the BI Picture Books’ main characteristic is about comparing a specific feature over multiple tools. Therefore, put the screenshots of a given feature for multiple tools side by side on the same page or slide. The subsequent paragraphs will illustrate how a concrete BI Picture Book might look. 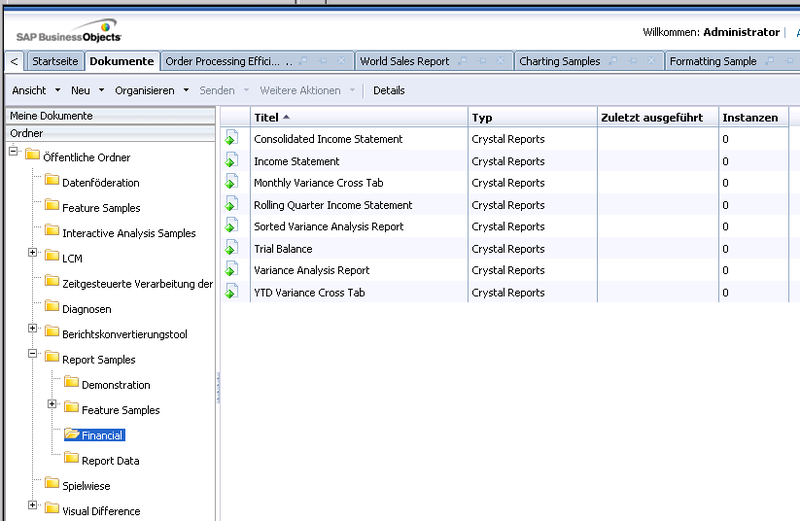 Screenshots are taken from various SAP Business Intelligence front end tools. 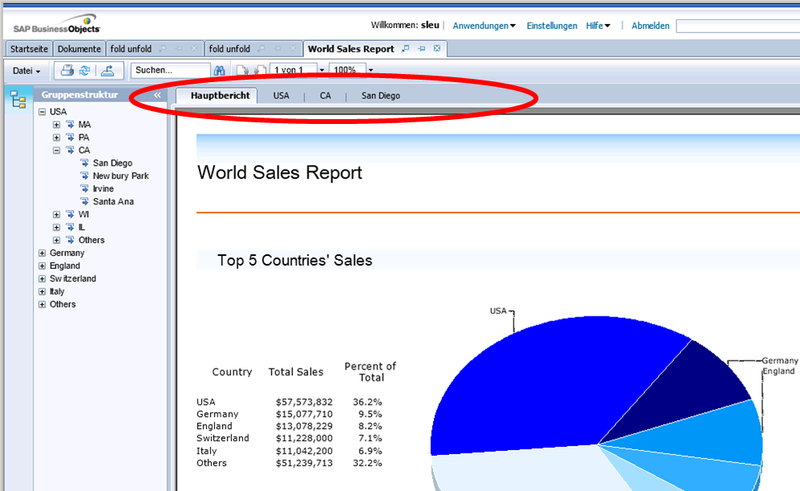 For navigation options outside of information, products typically screenshots of a BI portal are to be taken. This can be either based on a vendor specific portal or your company’s intranet site (or both if end users have a choice and need to decide which one to use). 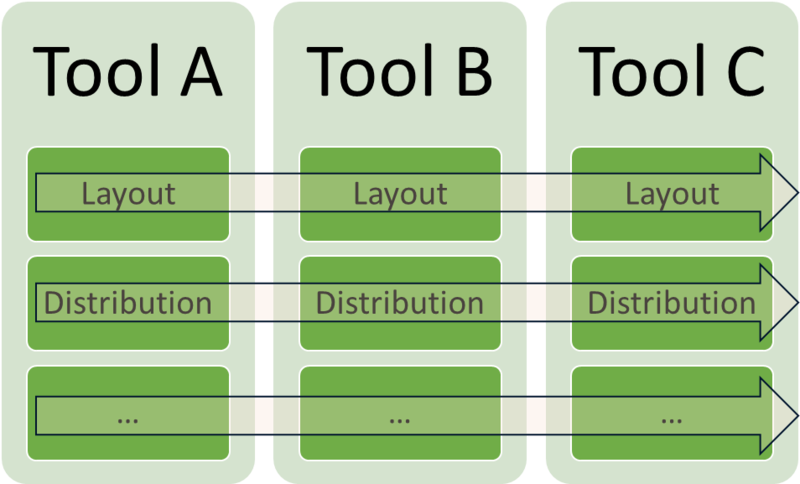 The drill-down example, in particular, shows that it is not enough for an end user to simply specify “we need drill-down functionality” as a requirement. End users need to specify requirements in alignment with the different options of drill-down available. Make sure you list all important features and highlight the unique ones as well as limitations that are not obvious. This helps end users to compare the different options. In some cases, it is important to shed more light on the settings of features such as charts. By way of example, specify if it is possible to change the colors of a pie chart? Next up are functional options, for example export. It is quite simple to find the available options and therefore it is easy for end users to choose from the existing options. It is useless, for example, if you let someone define that he wants a PowerPoint export from a front end tool, if it does not exist. Of course this would be nice, but it is simply not part of the catalog. An up-to-date topic which falls into the category of delivery options is mobile-device compatibility. This is becoming increasingly important at a time when all information should be available independent of the end users geographical location. Depending on the BI vendor and the BI tool itself, mobile devices support can differ considerably. Some serve the information products 1:1 to mobile devices. Others transform existing information products into specific mobile versions, which might have quite a different look and feel compared to the original information product. As with content options, it is somehow difficult to visualize security options using screenshots in a meaningful way. Try to focus on the comparison aspect between different tools and highlight unique features and limitations that are not obvious. 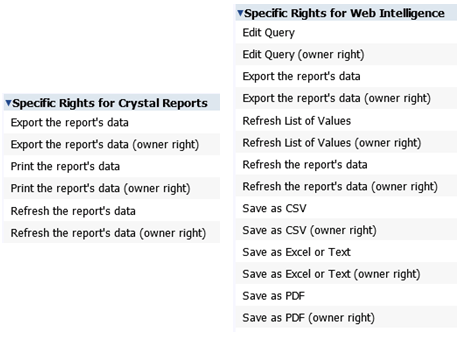 The following example illustrates the available access rights for two different tools. One tool can simply restrict the export functionality in general, whereas the other tool can control the different export formats. It is hard to illustrate this category using screenshots. Yet, as indicated in a previous paragraph, you can try to find other illustrations to guide your end users in specifying qualitative requirements. As with my other blog posts this article doesn’t aim to be a complete list of something. A BI Picture Book is neither the only way to define BI specific requirements nor is it enought to define a complete BI front end tool strategy. It shows you a particular idea and it is up to you to apply it in your organization in combination with other appropriate methods. Please share your experience – I’m looking forward to reading your comment just below!